Lisbon is very famous for fado, the mournful folk music that expresses saudade, a feeling that can be translated in English as the one of longing and melancholia. Since it is something very typical, as in the most places in Europe, you have to pay to enjoy it. 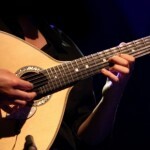 The fado is played in restaurants, but in most of them you have to spend at least 25€ per person. Luckily some others don’t have the minimum spend or cover charge, as the Tasca do Jaime, located at Rua da Graça, 91, in Graca, the working-class neighbourhood. It’s not a real restaurant, it’s more like a tiny bar having all the walls covered by fado posters. The owner is very friendly, he is really nice, and welcomes every guests giving them a kiss, showing his interest in checking that everything is OK and you like what you are eating or drinking. 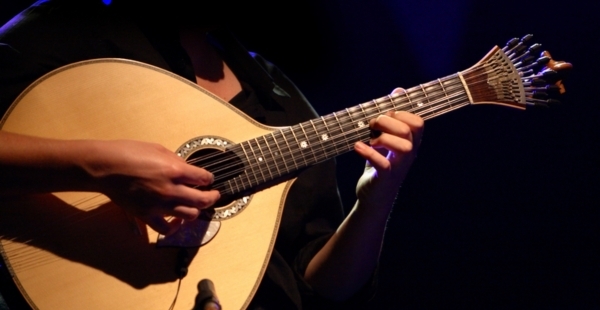 Fado is performed on Saturdays, Sundays and public holidays. The schedules says from 4 p.m. to 8 p.m., but get there early for a chance of a seat. Sometimes you will see some old men from the audience getting up and singing, while two guistarists starts to play some powerful but tragic melody. Folklore can be seen in a different way, throught what is called azulejos, the Portuguese term for tiles. These ceramic patterns are not only colourful, as everybody knows, I guess, but they are used to decorate the exteriors and interiors of … let’s see: everywhere! From humble homes to palaces, from churches to metro stations. It’s so lovely going around and see all this material making the city happier, nicer and alive! Of couse there is also a museum containing all this stuff: it’s called the Museu Nacional do Azulejo (National Tile Museum) and it’s located at Rua Madre de Deus 4. It’s open from Tuesday to Sunday from 10am to 5.30pm. The entrance fee is 5€, or, write it down, if you go on Sundays before 2pm, it’s free.